Pair a hot pink sheath dress with a Portolano fox fur pom pom cashmere scarf for an unexpectedly cool ensemble. Opt for a pair of black suede ankle boots to instantly up the chic factor of any outfit. 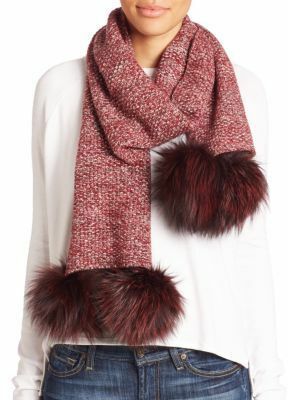 Pair a red sheath dress with a Portolano fox fur pom pom cashmere scarf if you're on the lookout for an outfit idea for when you want to look casually cool. Kick up the cool of your outfit by wearing red suede pumps. 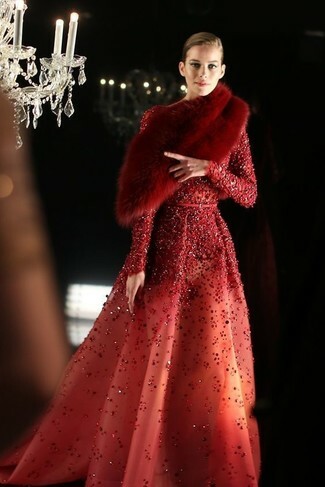 If you're on a mission for a casual yet totally stylish getup, wear a red sequin evening dress and a Portolano fox fur pom pom cashmere scarf. Both items are totally comfy and will look fabulous paired together. If you're a fan of comfort dressing when it comes to your personal style, you'll love this uber cute pairing of a gold lace maxi dress and a Portolano fox fur pom pom cashmere scarf. Amp up the cool of your getup by completing it with red satin pumps. If you're obsessed with relaxed dressing when it comes to fashion, you'll love this super cute pairing of a grey coat and a red fur scarf. Bring instant interest and excitement to your outfit with black leather pumps.